We are excited to continue with our second blog-interview! Please meet Rebecca, an amazing staff member who always surprises us with her work in our Children’s Programs! Rebecca, what is your position with For One Life? I am the director of Children’s Programs. I take care of planning and arrangements concerning everything that has to do with Children’s programs. My daily tasks include writing scripts for the Dramas we play, buying supplies for the programs and making plans for all the activities we do with the children. How did you start working for For One Life? I came to know For One Life through a Social Networking website and also from a friend. Two years ago (January 2016) I started working at Life Café which is one of their projects and then I joined the Children’s Program as director in July 2017. From your personal perspective, what are you trying to achieve by doing the work you do? I personally would like to achieve spiritual growth, enhance my skills and develop my personality because this is one of the largest platforms for me to achieve them. I really think this is the best decision I ever made but I still have a long way ahead of me! What effect has your work/ministry had on the local community? I notice change in the children’s personality of the project areas as we teach them about discipline and manners. 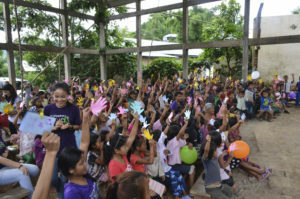 Through us they get to learn new songs, games, and other activities, which is very helpful for personal growth. For some of them it is the first kind of Children’s program they’ve experienced so far. What impact do you hope to see on the community in the future as the result of the work of For One Life? For One Life has been impacting a lot of people’s lives from the community, especially among children and youth because they can experience a lot of new things instead of just watching it on television. Now they can experience it in reality. e.g. : For children we have Children’s Retreat, Kingdom Kids etc. Through these programs, children get opportunities get more involved with other children from different communities and tribes. For the young people, we create job opportunities. In fact, I am one among the beneficiaries! For example, “Life Café” is one of the top restaurants in town, apart from giving youth the chance to earn some money. This is a blessing for the whole community, as they can experience this kind of fancy restaurant, and the youth can also express their talents and skills. The same is going to happen with the youth center which is still on the 5 years plan and will also be a source of development for the people. So I hope it will eventually bring a lot of change and development in the community if we can implement new projects, improve our infrastructure and keep going with strong faith. Tell a short story about an interaction that you’ve had with a specific person during your work with For One Life. 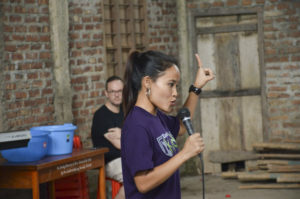 One of the teachers from the Project Village told me that after we visited them, the children were able to come up with ideas on how to arrange activities like performing dramas, choreography, singing and they actually performed some of them in front of their church! Our project has been a great helping hand for the children to get more socialized, stand out and perform with the experience that they gained with us. This really makes me love my job all over again. Moreover, the teacher said that the drama that we showed them is really helpful for them because they can understand more by seeing in motion what they are told. Share a struggle that you face in doing day to day NGO work/ministry. A real struggle is when I see children of remote areas who still do not have the opportunity to experience this kind of programs and are still way behind from children from nearby towns. I believe we can help them sometime in the future but we are still not in the position to do it right away. How are some ways that other members of the For One Life team encourage and motivate you? So this makes me want to try to do my best. Not only at work but also in my family, friends, church and the community I am in. He has contributed a lot in my life and who I am today (personally and spiritually) and he has really been a blessing to me. He is like a father to me. How has serving the community changed you personally? Serving the community has changed my life a lot as I can see the change and development with my own eyes which is really fascinating! I have begun to know how talented and skillful the people of the community can be when they have a platform to expose themselves. It’s always great to see someone who got a little help and hear from them how much that meant to them and how it changed their life. So this makes me want to serve more wholeheartedly as I know I can build up the community – through For One Life. What is the biggest joy or blessing that you personally have received because of your work with For One Life? Personally, there is a great change in me after working with For One Life. Now, as my work is mainly among children, to have a successful program it requires a lot of preparation. So, for that, it involves a lot reading, meditating, going through different books to get knowledge as I have no degree or experience on the side of Children ministry. This can enhance my spiritual growth and develop my personality and skills. So that means that even just with the preparation required, I’ve learned so much. As we go out to the field, as a team leader, everything is in my hand so I’ve learnt to be dependable. Also, Rosie Esh, who is my supervisor, has always been giving me a piece of advice to the point where I’m lacking. This has helped me to improve, and finally stand up in front of large crowds and teach. This used to be my weakest point. One of my ambitions in life was to become a public speaker, but now I’m almost getting over it, as I think I’m already achieving most of the things I wanted to. My salary is not really a matter to me, but achieving what I dreamt of, this is what really matters to me. So this is one of the biggest blessings that I personally have received because of my work with For One Life. In which personal areas do you feel that you need to grow in order to serve the community more effectively? In my opinion, to be more effective I still have to learn many things on how to interact or deal with people more professionally on the projects where I am in right now which is something I think I can do soon. In short, I need training on working with children in one way or another. What is your favorite For One Life project ​(besides the one you are currently involved in) and why? My favorite project of all is the Life Cafe, because it feels great to sit in a restaurant after a hard day and see someone showing up with a big smile coming with the food right in front of me. That really makes my day. Besides that Life Café is a stage for most of the talented singers in town, so that they can be able to expose their musical talents.